A combination of executive departures and disappointing financial performance has rocked the retailer's stock this year. 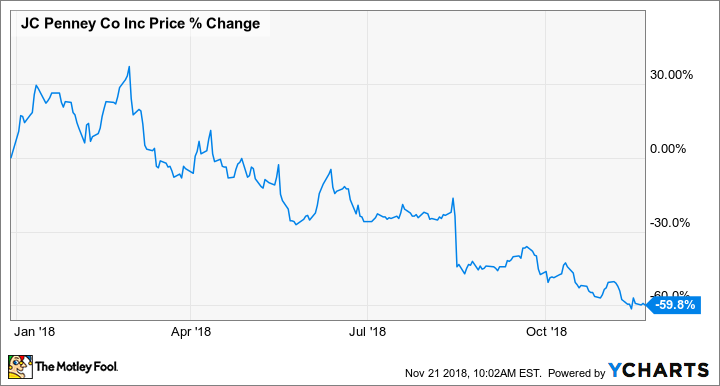 So far, 2018 has been a rough year for J.C. Penney (NYSE:JCP). In fact, pretty much every year since 2012 has been a forgettable one for the department store chain following former CEO Ron Johnson's misguided experiment to change the company's sales model. The stock has plummeted 60% so far in 2018, hitting all-time lows after yet another disappointing earnings report last week. As the chart below shows, with the exception of a plunge on its second-quarter earnings report, the slide this year has been mostly gradual. That's a sign that J.C. Penney's sell-off has been driven not by a single event, but rather by the growing sentiment that the chain's turnaround efforts are failing and that it will eventually follow peers like Sears, Bon-Ton, Toys R Us, and others into bankruptcy. Let's look at a few of the themes that have pushed the stock even lower this year. In many ways, J.C. Penney's underwhelming performance hasn't been much different from previous years. It continues to post quarterly losses, and comparable-store sales growth has been fickle. But a singular problem that has troubled the retailer this year has been the rapid departure of top executives. The most surprising one of all was CEO Marvin Ellison's sudden resignation in June, when he left J.C. Penney to take the top spot at Lowe's. That left Penney without a CEO for several months, as the company created an Office of the CEO in its place, comprised of several other executives. That Ellison departed so abruptly not only left a void in leadership in Penney's C-suite, but also signaled to investors that the retailer's problems might be beyond repair. Ellison struggled for three years to turn around the business. He saw the company and all its flaws up close, and jumped ship as soon as an opportunity came up. In September, CFO Jeffrey Davis also left the company, and his departure followed that of Chief Customer Officer Joe McFarland, who quit his job to follow Ellison to Lowe's. Those two made up half the Office of the CEO. Penney seemed to take a step in the right direction when it named Jill Soltau, the former CEO of Jo-Ann Stores, as its new CEO, and Soltau promptly brought on Michael Fung as its next CFO. Fung most recently served as the interim CFO at Neiman Marcus. Soltau's first earnings call seemed to inspire confidence among investors as the stock spiked after initially falling. But it's clear from the company's financial performance and so much executive turnover recently that she has a considerable challenge ahead of her. Part of the bull case in recent years for J.C. Penney has been that the company would gain market share as rivals like Sears closed stores and eventually went bankrupt. More than any other retailer, it seemed poised to gain sales from Sears' failure as the two chains co-anchor hundreds of malls. However, Penney has not been a noticeable beneficiary from Sears' demise. While home-improvement retailers like Lowe's and Home Depot have taken Sears' market share in appliances, Penney's comparable-store sales actually fell 5.4% in its third-quarter report, indicating the company is losing market share and sales at a time when peers like Macy's and Kohl's are seeing solid growth in comps. At Penney, comps are down 1.7% through the first three quarters this year, a sign that any benefit from the decline of Sears, as well as Bon-Ton and Toys R Us, is not enough to compensate for the retailer's broader weakness. J.C. Penney's recent struggles are especially confounding because its woes are coming when nearly every economic indicator signals that the consumer economy is strong. Consumer confidence is near record highs, unemployment is near 50-year lows, and the stock market was at an all-time high just a couple of months ago. Meanwhile, retail sales have seen significant growth this year. According to the Census Bureau, retail sales are up 5.3% through the first 10 months of the year, and sales at general merchandise stores are up 3.6%. J.C. Penney's department store peers have largely seen their stocks soar over the last year, driven by improving fundamentals. But Penney has been unable to benefit from that tailwind, adding to concerns that the next recession could kill it. With more than $4 billion in debt on its balance sheet, the retailer will eventually have to return to stable profitability in order to have a long-term future. After its performance thus far in 2018, it's clear why investors are starting to fear that the end may be near.